As a mother, you know that massaging your little one provides a wonderful opportunity to connect and also to care for your baby's skin. But did you know that baby's skin can lose moisture upto 5 times faster than yours? That's why we created Baby Dove Rich Moisture Baby Massage Oil. It is specially designed to lock in moisture, soothe dry baby skin and is a pleasure to use. Its light, non-greasy and fast absorbing formula keeps baby's skin feeling soft and moisturized all day long. Explore the entire range of Massage Oils available on Nykaa. 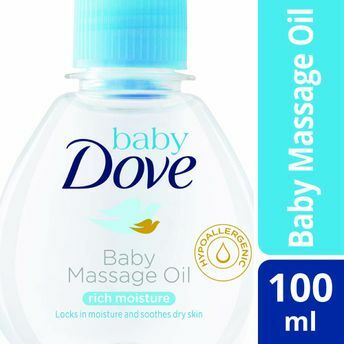 Shop more Dove products here.You can browse through the complete world of Dove Massage Oils .Alternatively, you can also find many more products from the Dove Rich Moisture Baby Massage Oil range.